Tap And Die Combination Sets Provide Everything Needed For Creating Screw Threads. 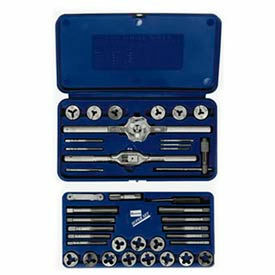 Tap and die sets include a wide range of tools for easily threading nuts and bolts. Tap and Die sets are available in a variety of size ranges. Dimensions vary per model. 18 Piece Tap and Drill Sets Provide A Selection Of Sizes For Matching Taps And Drills. 18 Piece Tap and Drill Sets are made of high speed steel ground threads for long lasting durability. Pairs right tap and drill needed for desired application. All taps provide standard plug chamfer type. Types are Metric, Metric/Spiral Point, National Coarse, National Coarse/Spiral Point, National Fine and National Fine/Spiral Point. Number of pieces in set is 18. 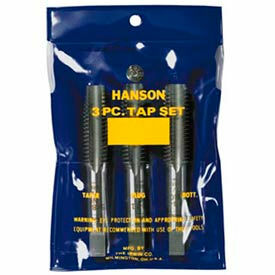 Irwin® Hanson® Tap Sets Are Used For Fast, Precise Thread Creation. Plastic Pouched Sets are made with high carbon steel and include one taper, bottoming and plug tap used for auto repair and machinery where metric threads are needed. 13 Piece Sets produce threads that are strong and easy to tap. 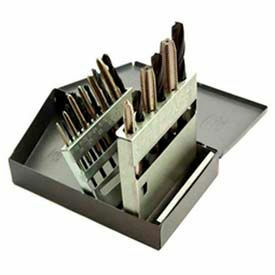 Tap And Drill Bit Sets are used for general purpose threading. All taps are high carbon steel, and all drill bits are high speed steel.